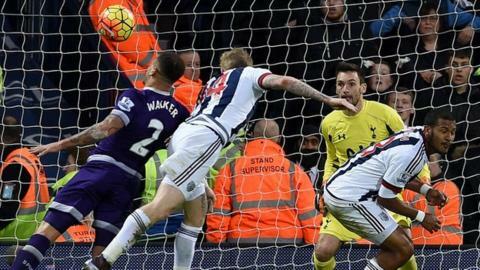 Tottenham lost ground on the Premier League's top four after letting a lead slip at West Brom. Mauricio Pochettino's side were ahead after 15 minutes when a long Toby Alderweireld pass picked out Dele Alli, who flashed a volley past Boaz Myhill. But Spurs' intensity dropped after that strong start and West Brom levelled before the break when James McClean's header concluded a patient move. The draw means Tony Pulis' side stay 13th, nine clear of the bottom three. Having advanced stealthily on the top four in recent weeks, consecutive draws have dented Tottenham's momentum somewhat. A goalless draw against Chelsea last weekend would probably have been considered a decent result, but the failure to take all three points at The Hawthorns will be a disappointment - particularly after the way Pochettino's side started this game. Composed in possession, resolute defensively and menacing in attack, they were well worth the lead given to them by Dele Alli's fine goal. However, the north London side allowed West Brom to wrest back the initiative and were unable to seize control again after conceding, despite having plenty of the ball. Indeed, it was the hosts who looked more likely to win the game in the closing stages. Underpinning West Brom's revival was their strength in midfield. Centre-back Jonny Evans impressed in an unfamiliar left-back role in the draw with West Ham last Sunday and was given an equally unusual central midfield deployment against Tottenham in the absence of the suspended Claudio Yacob. And, while some way shy of a playmaking quarterback, the Northern Irishman was a reassuring and redoubtable performer in tandem with former Manchester United team-mate Darren Fletcher. His presence permitted both Fletcher and James Morrison licence to attack and both were involved in West Brom's goal - a cutely crafted effort down the right that culminated in Fletcher clipping a teasing cross to the back post for McClean to thump past Hugo Lloris. Evans also nullified the threat of Spurs feted attacking trident of Alli, Christian Eriksen and Erik Lamela, with the England midfielder's initial influence dwindling until his second-half substitution. One scar upon West Brom's combative display was an awful challenge by goalscorer McClean on Mousa Dembele in the closing stages. The Irish winger was high and late, and was very fortunate to escape with only a yellow card after referee Jon Moss consulted one of his assistants. "It is reckless," said manager Tony Pulis, who also confirmed that winger Stephane Sessegnon suffered a hamstring injury. "I have spoken to him afterwards, and he should not go in for challenges like that. He has that in him, but he is not a nasty or dirty player." West Brom manager Tony Pulis: "Little breaks, we need them to go for us against the bigger clubs to win those games. But I was very pleased with the effort and the commitment. "This is the toughest job I have had. You need time, and there are a lot of things I want to change but to effect change you have to stay in the job for a time." Tottenham manager Maurico Pochettino: "The feeling is not great. Maybe we dropped two points but if we analyse it, it was very solid performance and the conditions were very difficult, against a team that want to fight for every action. "Maybe we deserved a bit more but it was a very difficult game. But Arsenal and some very good teams have dropped points here too in recent weeks." Tottenham host Monaco in the Europa League on Thursday before welcoming Newcastle next Sunday. West Brom travel to Anfield on the same day. Match ends, West Bromwich Albion 1, Tottenham Hotspur 1. Second Half ends, West Bromwich Albion 1, Tottenham Hotspur 1. Attempt missed. Salomón Rondón (West Bromwich Albion) right footed shot from more than 35 yards misses to the right. Assisted by Jonny Evans. Delay in match James McClean (West Bromwich Albion) because of an injury. Offside, Tottenham Hotspur. Mousa Dembélé tries a through ball, but Clinton N'Jie is caught offside. Delay in match Mousa Dembélé (Tottenham Hotspur) because of an injury. Mousa Dembélé (Tottenham Hotspur) is shown the yellow card. James McClean (West Bromwich Albion) wins a free kick on the left wing. Substitution, Tottenham Hotspur. Clinton N'Jie replaces Dele Alli. Attempt saved. Salomón Rondón (West Bromwich Albion) right footed shot from outside the box is saved in the centre of the goal. Assisted by James McClean. Corner, West Bromwich Albion. Conceded by Kyle Walker. Corner, West Bromwich Albion. Conceded by Hugo Lloris. Attempt saved. Jonas Olsson (West Bromwich Albion) left footed shot from very close range is saved in the top centre of the goal. Assisted by Craig Dawson with a headed pass. Craig Gardner (West Bromwich Albion) is shown the yellow card. Attempt saved. James McClean (West Bromwich Albion) right footed shot from the centre of the box is saved in the bottom right corner. Substitution, Tottenham Hotspur. Son Heung-Min replaces Erik Lamela. Erik Lamela (Tottenham Hotspur) wins a free kick in the defensive half. Attempt saved. Mousa Dembélé (Tottenham Hotspur) left footed shot from outside the box is saved in the centre of the goal. Assisted by Harry Kane. Attempt missed. Chris Brunt (West Bromwich Albion) left footed shot from a difficult angle and long range on the right is high and wide to the left from a direct free kick.